A well-known side dish at backyard cookouts, baked beans are a staple on any picnic table. 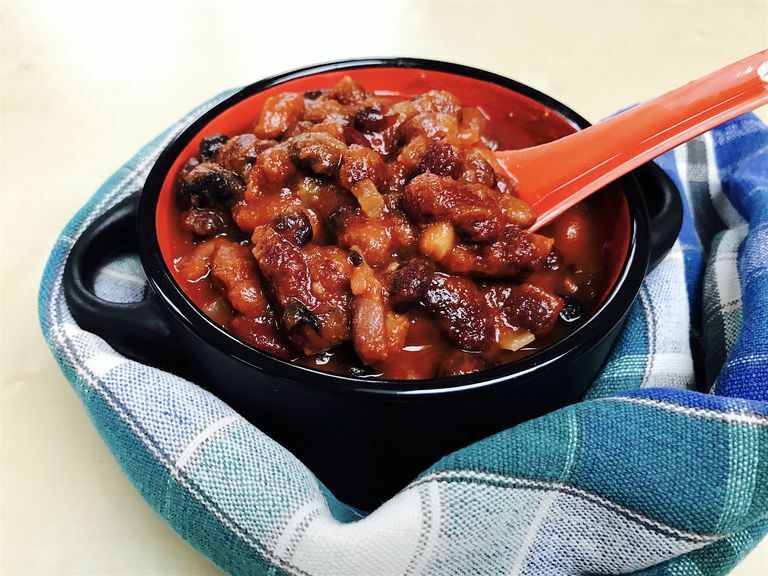 This version is loaded with dietary fiber—5 grams per half cup as well as protein, potassium, and iron from a trio of luscious legumes: black beans, pinto beans, and kidney beans. Beans are good for overall health as they fill you up on fewer calories, which is good for weight management, as well as keeping cholesterol, blood sugar, and blood pressure in check. Eating beans regularly has been shown to slow cognitive decline. In other words, beans protect your brain from aging! Along with fiber, this dish offers the ruby red goodness of cooked tomato sauce, which is loaded with the antioxidant lycopene. They're enhanced with raw, unpasteurized apple cider vinegar for a balance of flavor and gut-friendly bacteria, as well as shallots from the allium family of vegetables, which are good for fending off cancers and keeping your heart healthy. Honey adds a light hint of natural sweet flavor, which offers an energy boost for your brain. Add beans and tomato sauce to an oven-safe bowl. Stir gently until combined. On the stovetop over medium-low heat, add oil to a small skillet. Heat for 20 seconds; add shallots. Saute for a few minutes until translucent. Remove from heat. Add cooked shallots to bowl with beans and tomato sauce. Add in paprika, garlic powder, apple cider vinegar, and honey. Stir gently until combined. Place in the oven. Bake for 30 minutes; check and stir. Bake for 15 to 30 minutes longer to allow the flavors to meld together. Remove from oven and serve. The smoked paprika in this dish contributes to its signature, mesquite flavor. If you desire, you can add more smokiness with bacon. Choose a nitrite/nitrate-free, uncured variety and use only a small amount. Toss in green onions or scallions instead of shallots, or whole garlic cloves for a more bold bite. To turn up the heat, add a few squirts of sriracha. You can use one type of bean or lentils in this dish, too. It works well with any bean or legume. You can puree whole tomatoes for the sauce. Use agave nectar instead of honey for the sweet notes, or if you want a zero-calorie sweetener add a packet of stevia. The longer you cook this dish, the better. The flavors blend together the more it cooks. This is a great dish for the slow cooker, too. Serve while warm. Store any leftovers in the refrigerator to eat within 3 days of cooking. Reheat in the oven for 15 minutes or in the microwave for less than a minute. These baked beans can be spooned onto a baked potato or ladled over cooked quinoa or brown rice. It’s a great accompaniment to a lean burger, grilled fish, or chicken breast. Serve it in a whole grain bun as a vegetarian Sloppy Joe or enjoy it on a bed of greens for a warm salad.